AMERICA'S PARKS Through the Beauty of Art is an exhibition competition open to all artists, the purpose of which is to recognize and promote excellence in original artworks depicting any North American park (national, state, provincial, county, city) in Canada, Mexico and The United States. Selections will be made by a professional jury consisting of: M. Stephen Doherty, Editor, PleinAir™ Magazine; Susan T. Fisher, American Society of Botanical Artists Past President and Arizona-Sonora Desert Museum Art Institute Director; and Todd Wilkinson, Managing Editor, Wildlife Art Journal. The 2013 inaugural exhibition of AMERICA'S PARKS Through the Beauty of Art is scheduled as the first of three, with others to follow in 2014 and 2015. The 2013 inaugural exhibition will premiere in Bolivar, Missouri from March 17 - April 14, 2013 at The Ella Carothers Dunnegan Gallery of Art. The Dunnegan is a noteworthy museum that has hosted such notable traveling museum exhibitions as Art and the Animal of The Society of Animal Artists, Blossom ~ Art of Flowers sponsored by The Susan K. Black Foundation, Exquisite Miniatures by Wes and Rachelle Siegrist, and Paws and Reflect: Art of Canines, all of which have toured under the auspices of David J. Wagner, L.L.C. The Dunnegan has also had a tradition of hosting park art exhibits, notably, ARTS FOR THE PARKS. Coincidentally, David J. Wagner proposed the very first tour of the ARTS FOR THE PARKS exhibition, served as a Juror for that exhibit, managed the ARTS FOR THE PARKS tour for its first five years (1988-93), and served on the Advisory Board of its parent organization, the National Park Art Academy. 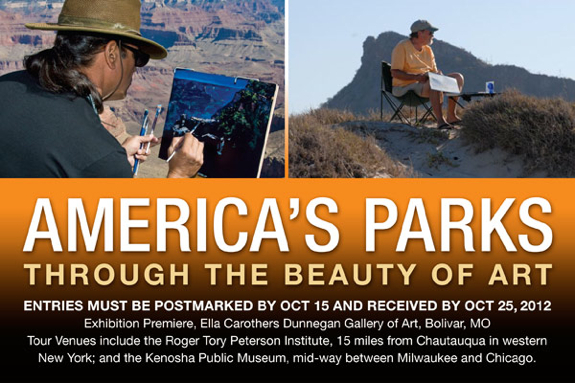 AMERICA'S PARKS Through the Beauty of Art is an entirely new initiative, produced by David J. Wagner, L.L.C. Original artworks depicting subject matter found in any national, state, provincial, county, or city park, or any park of any other such unit in Canada, Mexico, and The United States is eligible. Original, two-dimensional art completed in 2010, '11, or '12 is eligible. Eligible media includes: oil, acrylic, watercolor, gouache, mixed media, pastel, pencil, pen and ink, tempera, batik, alkyd, scratchboard, and original prints (e.g., lithograph, etching, engraving, serigraph). Ineligible media includes: any media not listed above such as computer enhanced or generated artwork, photography, reproduction prints, sculpture, video. Not including frame or mat, the maximum size for entered artworks is 900 square inches. Calculate by multiplying the horizontal and vertical dimensions. Example: A 30" x 30" painting would equal 900 square inches. Entries must be postmarked by October 15, 2012. Awards include: America's Parks Curator's Choice Award, Arizona-Sonora Desert Museum Juror's Choice Award, PleinAir™ Magazine Juror's Choice Award, Society of Animal Artist's Wildlife Art Award, Susan Kathleen Black Foundation Floral Art Award, Wildlife Art Journal Juror's Choice Award. David J. Wagner, Ph.D., will autograph copies of his book, AMERICAN WILDLIFE ART, at the Friday, October 5 Reception for the 52nd Annual Exhibition of The Society of Animal Artists at The Hiram Blauvelt Art Museum. Proceeds will benefit The Hiram Blauvelt Art Museum thanks to a generous donation by The Susan Kathleen Black Foundation. Bookshelves abound with accounts of wildlife artists and their artistry, but no book is truly comparable to American Wildlife Art. 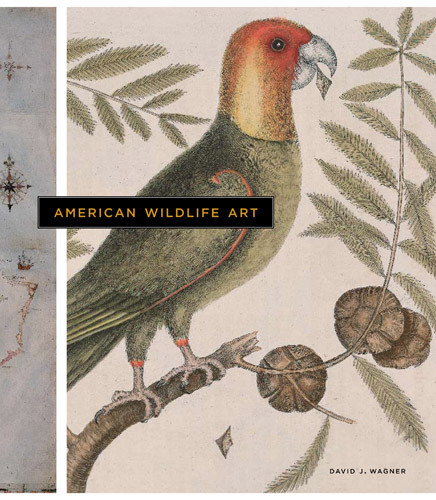 In American Wildlife Art, scholar David J. Wagner, tells the story of this popular genre’s history, shaped by four centuries of cultural events and aesthetic and ideological trends, from its beginnings in colonial times to the monumental works of the present day. In his insightful accounts of the artists, events, and trends at the heart of this uniquely American art form, Wagner explains how the aesthetic idioms and imagery of American wildlife art have evolved, how its ecological ideologies have changed with changing circumstances and ideas about animals and their habitats, and how artists and entrepreneurs developed and influenced the market for wildlife art. Wagner’s history begins with the works of John White and Mark Catesby, artists who documented the flora and fauna of the New World and presented Europeans with a view of both the economic potential and the natural wonders of the then sparsely settled continent. 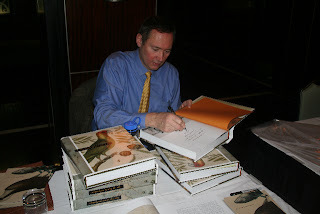 After the American Revolution, as the new nation grew, artists such as Alexander Wilson and especially John James Audubon caused the course of American wildlife art history to turn and advance, setting the stage for Arthur Tait’s collaboration with Currier & Ives, which brought wildlife art to the masses, and the work of Edward Kemeys, whose impressionistic sculpture captured the essence of disappearing wildlife like the wolf and buffalo at the same time that prominent Americans like John Muir and Theodore Roosevelt promoted wilderness preservation and the ethics of sportsmanship. As Wagner’s narrative moves to the twentieth century and beyond, it embraces in revealing detail the lives of artists Louis Agassiz Fuertes and Carl Rungius, painters who were among the most influential wildlife artists of their time. 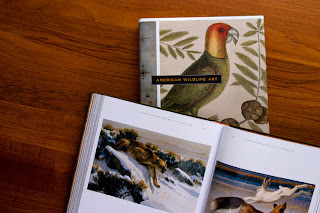 Wagner’s account concludes with portraits of recent and contemporary wildlife artists such as Ray Harm, Robert Bateman, Bob Kuhn, Roger Tory Peterson, Stanley Meltzoff, and Kent Ullberg—artists whose work at once departs from and embodies the legacies, traditions, and innovations that informed and preceded it. Through a rich array of illustrations and its incisive text, American Wildlife Art will appeal to collectors, conservationists, and artists—to everyone who already enjoys wildlife art or who is learning about it for the first time. Wagner’s authoritative and even-handed prose brings this compelling art form to life, reminding us of the treasures found on America’s wild lands. David Wagner joined the Society of Animal Artists as Tour Director in 1987. He served as Director of the Leigh Yawkey Woodson Art Museum from 1977 to 1987. David has also served as Curator of the Society of Animal Artists sculpture courtyard at National Geographic Society in Washington, D.C. from 2002 - 2007. He earned a Ph.D. at the University of Minnesota and wrote his award-winning, two-volume dissertation on wildlife art prints.